This volume explores the nexus between nature, markets, deregulation and valuation, using theoretically sharp and empirically rich real-world case studies and analyses of actually existing policy from around the world and across a range of resources. In short, it answers the questions: does neoliberalizing nature work and what work does it do? 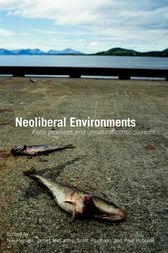 More specifically, this volume provides answers to a series of urgent questions about the effects of neoliberal policies on environmental governance and quality. What are the implications of privatizing public water utilities in terms of equity in service provision, resource conservation and water quality? Do free trade agreements erode the sovereignty of nations and citizens to regulate environmental pollution, and is this power being transferred to corporations? What does the evidence show about the relationship between that marketization and privatization of nature and conservation objectives? Neoliberal Environments productively engages with all of these questions and more. At the same time, the diverse case studies collectively and decisively challenge the orthodoxies of neoliberal reforms, documenting that the results of such reforms have fallen far short of their ambitions. "The natural world may well be neoliberalism's last frontier. This excellent collection of essays and critical commentaries helps us not only see through, but also beyond, this starkly utopian vision." "This excellent book maps the varied and profound impact of neoliberal processes on landscapes and livelihoods around the world. The specific and carefully theorised case studies are models of scholarship and provide many insights of value to those who wish to resist, reevaluate or rework what has become a dominant mode of environmental governance at the dawn of the 21st century." If you’re tired of a bland, feel-good environmentalism and want something more energetic and thought-provoking, this is the book for you. It has everything. Bulging with specific cases it is theoretically savvy and politically sharp. It delves into the new onslaught on nature contrived by the many-headed hydra of neoliberalism. Corporations, governments, and not a few environmentalists are all in the dock here, and a concluding section considers practical examples of environmental resistance. Bravo! Neil Smith Author, "The Endgame of Globalization"
"Neoliberal Environments is a foundational contribution. This book has a great deal to offer to geographers, environmental policy communities, and those engaged in neoliberalism and globalization debates. The case studies can easily be taken in isolation or read as a collection for teaching. Even those already familiar with published works in this subfield will find much to chew on in the commentaries and introduction. All in all, this is an outstanding anthology—establishing what high-quality research in this area can contribute and offering clear pathways forward for future scholarship." Nik Heynen is Assistant Professor of Geography at the University of Georgia. James McCarthy is Associate Professor of Geography at Penn State University. Scott Prudham is Associate Professor in the Department of Geography and the Centre for Environment at the University of Toronto. Paul Robbins is Professor of Geography at the University of Arizona.